Ever have a filter get stuck on the front of your lens? I personally have not, but I can imagine how irritating it can be. Travel photographer (and friend of mine) Craig Pulsifer posted the method he was instructed to use by Canon Professional Services to his blog. His warning: this is not for the faint of heart. 1. 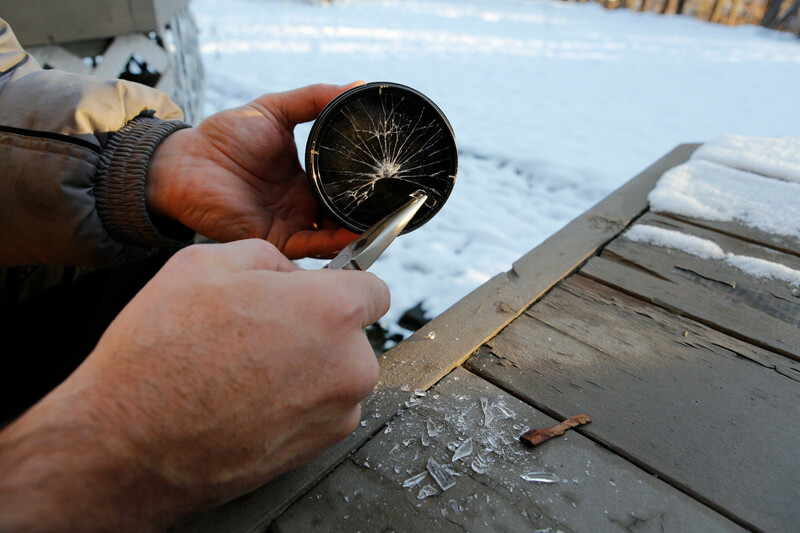 Use hacksaw to cut rim of the filter down to the glass. 2. 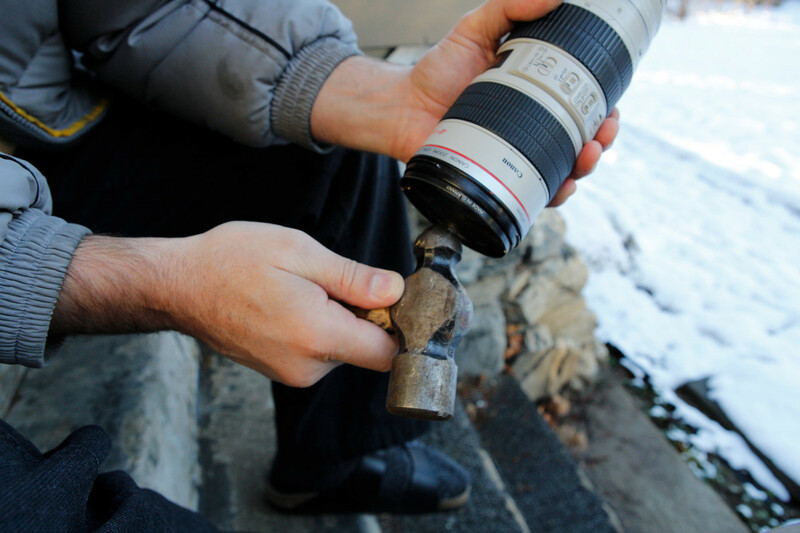 Use Ballpein hammer to strike filter glass in progressively hard taps until filter glass breaks. 3. Pick out shattered glass of filter. 4. 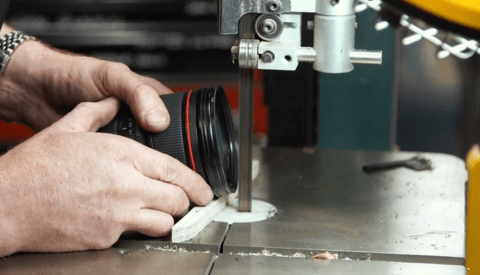 Blow off glass/metal bits, then using pliers, bend/peel edges of filter rim into the centre of the filter to pull pressure off of inner threads of lens. 5. 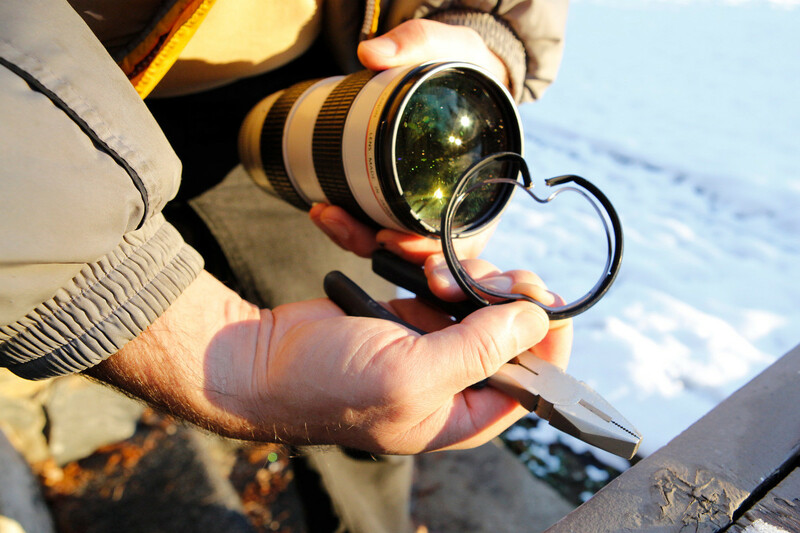 Using pliers, bend/peel edges of filter rim into the centre of the filter to pull pressure off of inner threads of lens. 6. Again, blow off glass/metal bits, and replace with new filter. 7. Praise God that it worked! 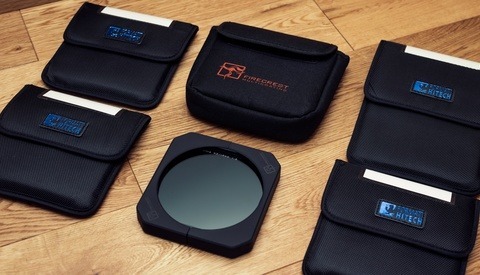 How have you gotten a stuck filter off the front of your lens? Have you tried this method before? Let us know in the comments below! 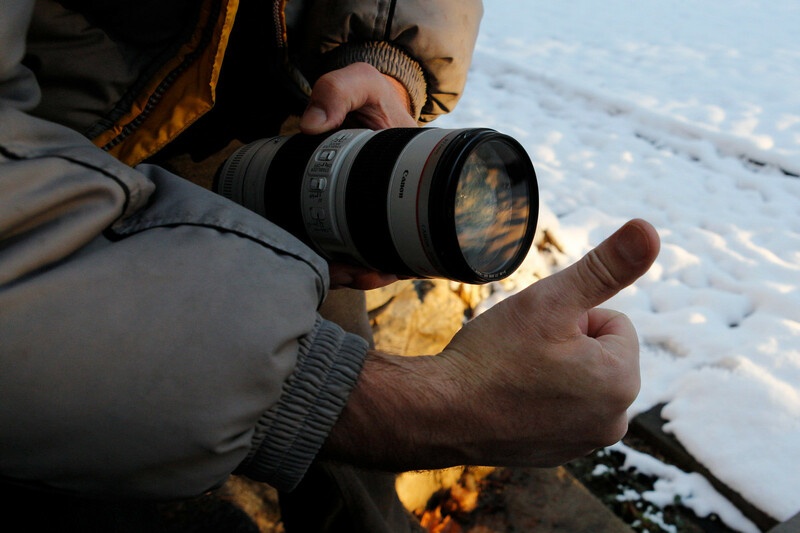 I've done this before on a couple of lenses (that were not my own). It's fairly easy. Just don't scratch the glass. Also, before the filter/no filter flame war heats up, use what you want to, it's your own gear. Yup, that's a fine alternative. Trouble is, the Canon tech warned that I might strip the inner threads of the lens body if I tried to manhandle the filter off; hence, the extra precaution. Or wrap gaffer tape around the filter and remove by hand. Twice I've encountered filters which couldn't be removed. I tried filter wrenches, but they couldn't grip it strong enough. Eventually, I went to an auto parts store and bought a pair of 4-inch hose clamps. 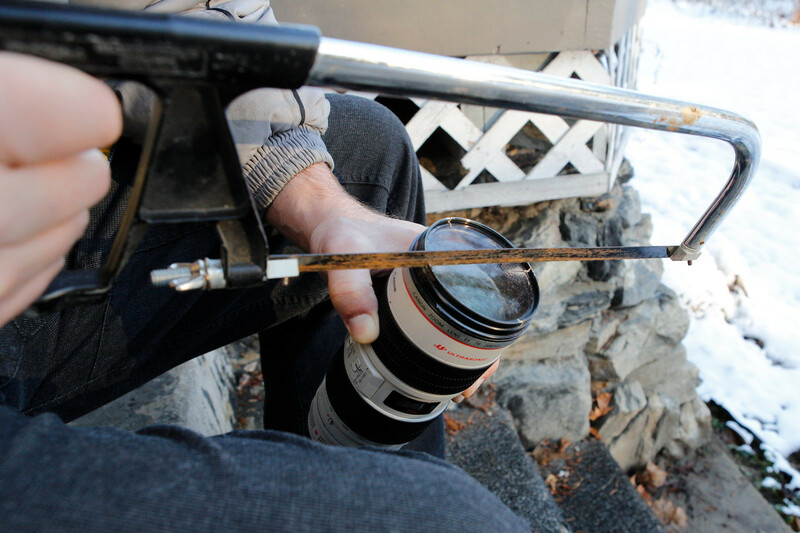 Clamped one to the filter and one to the lens barrel. Filter came right off. Nice approach! And it saves the filter. Ha ha! Filter wrenches... get it?? Just wrong kind of filters, but it worked! did canon recommend to have steril strips and bandaids close by? also, most camera makeers dont recommend blowing on the lens in any way, since the acids in your breath can harm the lens. this vid has to be a joke, a painful one. You'll notice that Craig has a blow tool. He never says blow with your mouth. OK, $64,000 question. 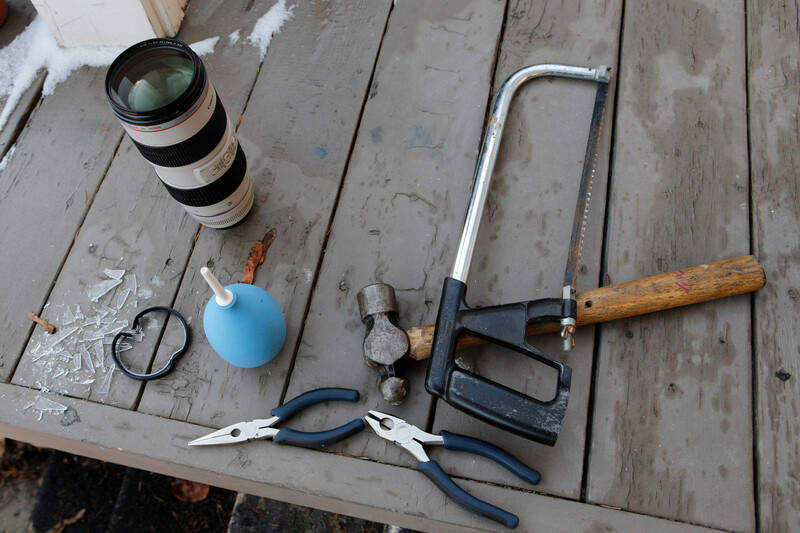 Who goes on assignment with a hacksaw, needle-nose and regular pliers, blower, and a ball peen hammer? Right. The person who doesn't have redundant equipment I guess. I'd figure it out afterwards. The person who gets paid $64,001 for a shoot. tool kit sat in the van, so I can repair on the job, includes all manner of tools, including screws bolts and load of spares, on foreign jobs a small toolkit comes along. I have also used the services of a garage to help remove a errant tripod plate which had become cross threaded, used there die set to repair the thread. uhm really, a little too much here. Heavy gauge wire cutters, snip one side, and then go about 2 cms and snip again. Pull off that part, and you will break the tension ring. they sell different kinds of kitchen tools and aids at many grocery stores and elsewhere to help unscrew stuck lids on jars. A stuck lid on a jar and a stuck filter on a lens are nearly the same, in terms of stuckness. Tried that approach first, James. 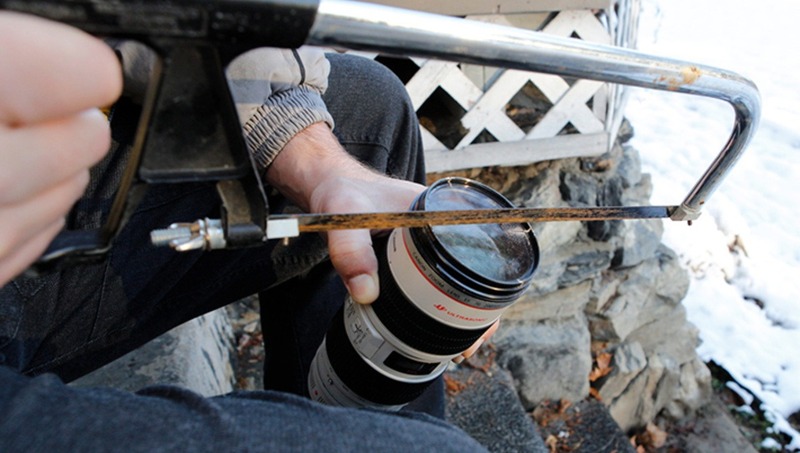 The lens had been dropped (from only a foot off the ground) and landed on the edge of the filter. This bent the ring and jammed it but good. I have the same issue... Did the freezer pack trick work for you Craig? Caleb, I didn't consider the freezer pack idea at the time. Canon techs warned that by trying to unscrew it I might strip the inner threads on the lens. But it certainly sounds like it'd be less invasive and certainly worth a gentle try before going for a ballpien hammer. 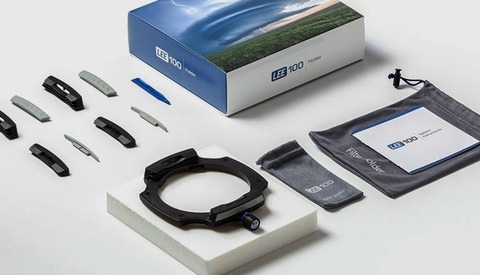 Good luck with the lens, bro. I've had a lens serviced at Canon before for the same problem. This solution seems to be standard practice for them, the only notable variation in my case being the application of tape to the glass of the filter prior to shattering. Starting with the hack saw if you just cut into the filter enough for the blade to be used as giant screw driver, you can crank the filter off. I've done this and still have the filter and none of the anxious glass-shard-picking fun you show here.